With two home pages and 6 sub-pages (is that what they're called??) within the second page, I've kept my iPad Mini pretty and organised, including the relevant emojis in the titles of each sub-page to keep things cute! My background was made with Monogram Lite for a personal touch, and I'd recommend downloading if you want a personal touch to your apple device too. Of course, everyone has their social page, with all their social media. You can find me tweeting on Twitter and Posting selfies on Instagram the most, and then you can find me watching countless videos on YouTube and catching up with the family on Facebook. I also use Facebook Pages for the blog's page and to manage The Golden Plaice page which is my mum and dad's chip shop. Random Fact: All the chip shop food in Eastenders is from my mum n dad's place! On my blogging page I of course have Blogger as a must have and BlogLovin' to keep up to date with all your lovely blogs! On top of that I have Blogsy which I've found to be the best blogging app so far that I've found! I've used it a whole lot lately and you wouldn't be able to tell because I can create posts exactly the same as I would on my desktop blogger. I don't like using Blogger for posts since their isn't many editing options so I'd definitely recommend purchasing Blogsy because it's totally worth the money and you've got the option to switch to editing in html mode too! If you know of any other blogging apps, leave them below because I feel like this page needs to stock up on blog things! I have a page solely dedicated to editing and picture apps, and I've popped them all under photography. For collaging, I use Moldiv and have done since my first iPhone 4S, photo editor for any simple edits and then Rhonna, A Beautiful Mess and Bleach are all for playing with photos for Instagram use the most! 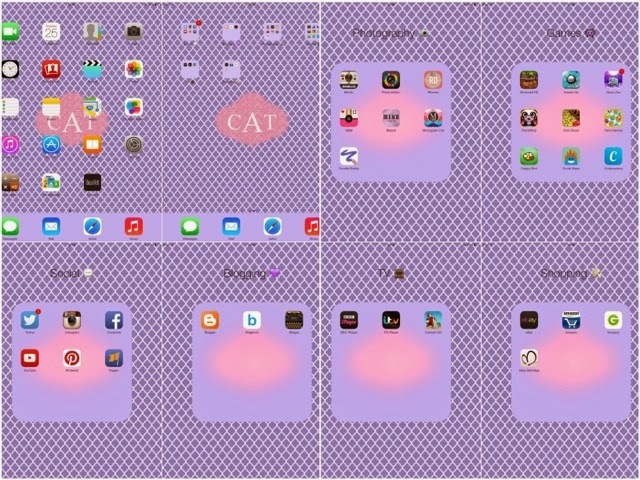 If I had to recommend one of these apps it would 100% be Moldiv! just because I've used it the longest and love it for collaging the above images and a lot of my outfit ones too! Games. I have only one or two on my iPhone because I prefer games on here. Yes, I am one of these geeks who play Minecraft and understand it, and I'm currently obsessing over Disco Zoo and Farm Heroes Saga (thanks mum). I'm always out for new games so if you have one that I could be totally addicted to, let me know. My iPad is also TV central to me. I love to watch things on the Cartoon HD app when I'm feeling like satisfying my inner child's need of Pokemon or Disney films. Unfortunately I don't think this app is no longer available, but there are similar ones out there. Of course, regular catch up TV channels like BCC iPlayer and ITV Player have made their way to the Pad and I've only just added 4OD after realising I watch copious amounts of their TV including Gogglebox and First Dates... Where do you come up with this amazing entertainment Channel 4!? The shopping page is a page I like to try and avoid but searching for deals on Groupon and checking out eBay is just a must! You don't want to lose out on amazing deals do you!? I have Amazon just in case I need it, and the all new Miss Selfridge app to keep up to date just in case I miss something for work. I would have downloaded all the other apps like the Topshop one and the ASOS one but with the iPad mini, I can shop on safari a lot easier, meaning there is no need to waste the app space when Safari is right there! I use my iPad more for fun, games and blogging more than anything else. I love it and it's probably the best Christmas present ever thanks to the amazing boyfriend. It's great for the internet as the pages on Safari come up like normal and the games are so much more fun on a bigger screen. With my iPad being a mini, it's so much easier to carry around for a cheeky play on my lunch break and to blog, since it's a lot more fun to this way, and it's easier. If you got any recommended apps, leave them in the comments and I'll be sure to check them out!